Like the history of stamps themselves, Xstamper has a rich and wonderful background. 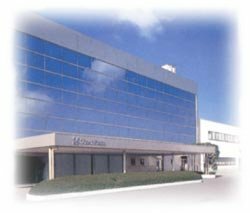 We started in 1925 as ink chemists and stamp pad manufacturers. Xstamper was born in 1964 while doing R & D on a more durable rubber marker nib. An accidental spill of salt into an experimental rubber compound resulted in development of cellular rubber for the most durable pre-inked stamps ever. Our mission is to make your online shopping experience for stamps, engraved signs and other personalized identification items the fastest, easiest, and most enjoyable shopping experience possible. We are committed to your shopping satisfaction and that’s why we make this promise: If you're not 100% satisfied with our products and service, we’ll do whatever it takes to make it right. What started as a small stamp-making business more than 75 years ago has blossomed into a $700 million dollar a year operation that includes more than nine factories and 900 employees worldwide. 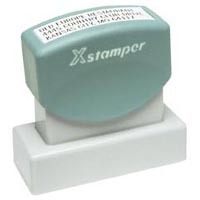 Today, www.xstamper.com is the place to find and discover any personalized product you want to buy online. We’re proud that we sell our products in 16 languages and in over 80 countries. We pioneered laser manufacturing for faster and better print quality, we created "one-size, one-cost" philosophy for greater value and style selection for easier ordering. Complete line of non-porous pre-inked stamps for making a permanent mark on glass, metal, wood or plastic. If you prefer traditional stamps we make them of rubber to hold up to oil based inks used in our special “Hi-Seal” industrial stamp pads. All of these products are perfect for industrial applications. A complete line of office and industrial pens and markers. Our Special Quote feature enables you to get a price and delivery quotation on any customized product you need. We offer any make of stamp and specialize in quotations of special application products. Shachihata Inc. works to protect the security of your information during transmission by using Secure Sockets Layer (SSL) software, which encrypts information you input. We will never display or reveal the entire card number when confirming an order once you enter a credit card number. We will only display the last five digits of the card preceded by asterisks. After approval of the order by the credit card company it is secure within our server as it is not used in the order fulfillment process. Pre-Inked Stamps: A pre-inked stamp holds ink within its own ink-saturated die, eliminating the need for an ink pad. Simply press the pre-inked stamp against the paper to make a clean impression. Laser Engraved: Laser engravers can create detailed graphics, replicate intricate logos, and engrave at various depths for a more textured finished product. All Xstamper® stamps are laser engraved using the latest laser technology. This process is by far the most convenient and offers the best quality impression. Gel Stamps: Gel pre-inked stamps have been made for the past 30 years and are known for starting out with a clean and clear impression that does not feather (bleed). Gel stamps are frequently inconsistent in quality resulting in warped dies or leaking stamps. Because gel stamps are not very durable and the production process is very messy and time consuming most manufacturers are abandoning them. Flash Stamps: Introduced in 1996, this process is much quicker than gel or laser processes allowing the manufacturer to offer “same day” service. Flash stamps are made with a stencil process that results in the rubber being covered in a thin plastic film. Most users feel they are temporary use products because the film develops cracks or small tears with repeated use. While development of this process continues, they make good impressions and can be re-inked. Self-Inking Stamps: Self-inking stamps are sold by almost every independent stamp manufacturer. In ClassiX® by Xstamper®, the self-inking stamp has a special mount that has a built-in ink pad and spring mechanism that automatically re-inks the die between impressions. Metal Stamps: With heavy-duty construction and precision components, these stamps ensure a smooth, quiet action. They are best used for rugged environments or where high-volume stamping occurs. Plastic Stamps: Economical with a lightweight yet very durable construction, these stamps are perfect for everyday use. They have been well-engineered for both ease and frequency of use. Traditional Stamps: Popular in large part due to their reasonable price and their quick delivery time; however, the ink pad that is necessary is messy and inconvenient. Most of these stamps are made with a photopolymer die. The dies are made of rubber if they will be used with non-porous (fast dry) inks. Our Artline® ink pads are heavily pigmented and produce a darker, bolder impression than competitive products. Photopolymer Stamps: Dies made from liquid photopolymer are quickest and least expensive for one of a kind dies. Hard sheet clear photopolymer is used as a master when the same design will be mass produced. Ribtype: Also known as ribbed rubber type, this stamp has a ribbed impression area that allows interchangeability for messages, stock type sets and custom logos. They can contain a wide range of sizes and type styles. Rocker Mount: Traditional stamp used for large impression areas, the rocker mount’s impression plate is curved allowing maximum image coverage from middle to sides. With traditional stamps, no message is too long or too short making them very accommodating. Vulcanized Rubber: Vulcanization is the process of treating crude or synthetic rubber or similar plastic material chemically to give it useful properties such as elasticity, strength, and stability. Vulcanized dies are made with hard sheet polymer, pressed under heat and pressure into a matrix. This matrix is the mold for gum rubber and vulcanized to make the rubber stamp die.